A fireman is rescued after he was trapped while working at the site of a landslide in Cambray, a neighborhood in the suburb of Santa Catarina Pinula, about 15 kilometers east of Guatemala City, Oct. 3, 2015. 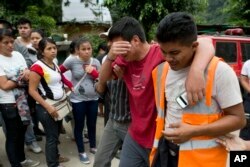 Rescuers resumed a desperate search Saturday for several hundred people believed missing in a landslide on the outskirts of Guatemala's capital that left at least 56 dead. At dawn, dozens of rescue workers, police, soldiers and volunteers with picks and shovels began clawing away at the debris left behind from the Thursday night disaster. Residents cry after finding out one of their family members died in the mudslide in Cambray, a neighborhood in the suburb of Santa Catarina Pinula, on the outskirts of Guatemala City, Oct. 3, 2015. Authorities said 350 people might be missing, and they expected the death toll to rise as the search resumed. Their estimate was based on the 125 homes destroyed or damaged by the landslide, which occurred after heavy rain. President Alejandro Maldonado said several countries, including the United States and Cuba, had offered to help.